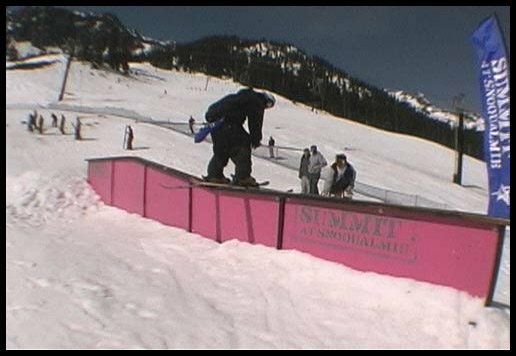 Part 3 of the Jib Series put on by the Summit at Snoqualmie, Jib This, took place at Alpental this past Sunday, Apr. 11. 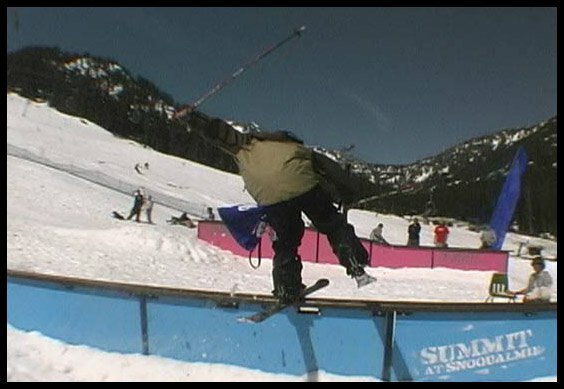 The competition format and setup was similar to the previous competitions: three jibs, double-kink rail, a flat rail, and a box gap, placed next to each other with a drop-in slightly above. This contest also sported the addition of a Ã¢â‚¬Å“butter box:Ã¢â‚¬? a banked box placed sideways across the bottom of the hill that allowed riders to approach from either side and get creative. Due to rider concerns about the box gap, Snoqualmie competition management decided to exclude the gap from the competition. All of the riders would have a one-hour jam to show their stuff on the other jibs. Throughout the one-hour jam, riders went off on every jib on the course, with most of the focus on the double-kink. By far the biggest feature of the course, riders had no problems greasing it. Nearly every skier was throwing some variation of a spin off the rail. The flat rail saw somewhat less variation, but was still host to one-footers and switch ons by many competitors. The butter box, untouched throughout most of the jam, underwent a huge session in the last ten minutes. Riders got creative with this unique feature, spinning on and trying their luck at tail presses on the top edge. After a slight delay to tabulate the scores, JD Thompson, Andy Mahre, Zach Davison, Erich Kunz, Shawn Mauer, and Dylan Flint advanced to the finals. The format for the finals allowed the six finalists to jam on each of the three features for 15 minutes. The first of the three jibs was the flat, where all of the riders attempted to step up their tricks from the earlier qualifying jam. Davison was attempting fast slides (only the uphill ski on the rail) to backside 270 out, but was unable to clean it. Kunz perfected his switch on 270 out throughout the session and stomped a switch on, switch up just before the jam ended, and Mahre stomped a 270 on 270 out as well. The double-kink was the next feature, and Andy Mahre started off the session with a perfect 270 on 270 off on his first hit. The rest of the riders tried hard throughout the jam to one-up this: Davison did some inline-style royale grinds with a 270 out, Mauer got the rail with a 270 out and was working hard on grinding it switch, and Kunz greased it with a switch on 270 out just before the jam was over. The last feature of the competition was the butter box. It was a fun jib to end the contest on because it allowed the riders to get creative. Flint was stomping a cool 180 on 180 off throughout the jam, grinding switch across the box. With only a little time left, Kunz greased a lipslide 270, on 270 off. Following this, Mahre brought a 270 on, surface spin 180, 270 out to end the jam. The top three riders got a bag of schwag from companies such as DaKine, Electric, K2, and Oakley. A special thanks to the Summit at Snoqaulmie for running another great competition. To any skiers in the Northwest, you should try to make it to their competitions next year and show support so resorts will start giving skiers as many prizes as they do snowboarders.